One of the things that really struck me in moving over here was the whole low cost travel thing – you know the pay £20 to fight the hoards to get to a(n unallocated) seat only to find no room in the overhead compartments and a simply foul cup of coffee costs you an arm and a leg. Bloody bonkas, I remember thinking, who would actually do this? It would seem quite a lot (including me on the odd occasion). Called The Skyrider, one literally ‘saddles up’ for the duration of their inflight tenancy and enjoys just 23 inches of legroom – 7 inches LESS legroom than the average aircraft seat offers. That’s shorter than 2 normal-sized rulers! And apparently there’s storage space….baaahaahaaa! The seat…is like a saddle. Cowboys ride eight hours on their horses during the day and still feel comfortable in the saddle. Yeah right! I usually leave my chaps and spurs at home and anyway, have you seen the way those cowboys walk? Never say never…but really, would you pay for this? This entry was posted in A Traveller's Life by Kym Hamer. Bookmark the permalink. In the U.S.A., too, the movement is towards coach seats that don't recline so that the airlines can squeeze rows closer together. 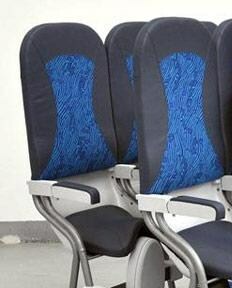 No-recline Airbus A320s have 178 seats compared with 150 seats on the regular A320s. But the planes with more seats have the same number of overhead bins. More people therefore have to check on their bags–and pay for this. Soon they'll have to pay fees for carry-ons as well, with one of the airlines over here announcing it intends to charge up to $45 per passenger. This is despite consumer outrage, Congressional scorn (a bill has now been introduced in Congress to outlaw carry-on baggage fees), and federal investigation into whether airlines are properly disclosing their fees to consumers. I abhor all of these trends that make life so much harder for us travelers, but I suppose in the airlines' defense, it's a tough business. Apparently, these baggage fees have become crucial to their bottom lines, dating from when the industry faced the double whammy of recession and high oil prices. VM – I flew Ryanair once…because I had to (work made me…bad, bad work!) It was like flying inside a bullet. Kate – what can I say? Def. the quip of the week! Why all those seats? There's only one cowboy in Ryanair. I saw this in the metro today and was gobsmacked. I think there is a limit to the lack of comfort I will accept, even for a 1 hour flight. And this goes beyond it.